Life I am the new year ~ Happy New Year!!! I thought this poem was absolutely beautiful & I wanted to share it with all of you. Please have an absolutely fantastic New Years Eve full of cheer & joy BUT in the end, please make the right choice and drive sober and safely. I want to hear all of your dreams come true over the next year and making the wrong choice behind the wheel tonight can take that all away from you! God Bless each and everyone of you for playing part in the 2009 chapter of my life. I am your opportunity to practice what you have learned about life during the last twelve months. to renew your allegiance to Him who said, "behold, I make all things new." 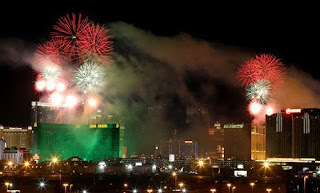 Fireworks are seen over the Strip at the stroke of midnight, starting the new year. The 7-minute, 11-second show, which cost $500,000, returned to hotel rooftops this year. An estimated 315,000 visitors were expected to ring in 2010's arrival in Las Vegas. 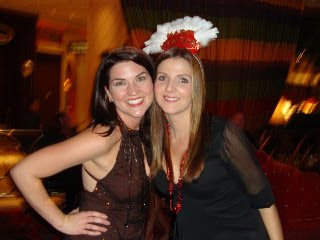 New Year's Eve in Vegas is an entirely different world than in Buffalo, NY. Everything is open and to all Vegans, it's just another night. Therefore, of course I had to work. Which I really didn't mind. On NYS Eve, we make an insane amount of money and we get to go home laughing at the people who came to Vegas and acted nothing like they would have back home!! I served the crew from the country band Big n Rich and had an awesome time!! 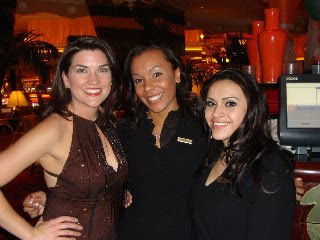 I am blessed to bring in the new year at a job I love - with co-workers I love! The only downfall was that I was not with the hubby BUT we did fully celebrate the night prior so it was okay. Doug and I had a great time at Springs Preserve Winter Lights Festival. It was really a nice display of Christmas Lights spread out over the 180 acres of preserve. I absolutely LOVED the decorated Cactus plants!!! SO PRETTY! we stopped at Kris Kringles Cocoa Shop for some delic hot chocolate and enjoyed all of the holiday cheer! I would suggest any family bring their children. So much for the kiddos to do! Baby it's COLD outside....Listen to the RAIN! What a strange day here in Vegas! Last nights weather forecast called for rain today. Rain all day. When Doug and I woke this morning, the sun was shinning and no sign of rain - then 45 minutes later, the down pour began! The sky was black and the rain was incredibly loud! Usually the rain in Vegas last a few minutes and the sun is back out again. Today - it actually lasted ALL DAY! The winter weather seemed to arrive quickly this year..........it will be gone that quickly too. 3 weeks of real cold days is all we really get. When I say really cold, I mean 40 degrees highs! Coming from Buffalo, I can't believe that I can even call that "really" cold!!! Thanksgiving 2009 - Truly a Blessing!!! Thanksgiving this year was truly a blessing! I have been in Las Vegas for one year and one month! It has been that long since I have been home! Holidays are VERY important to me and being a part of big family get togethers was always a family tradition for me! This year, it was just Doug and I........BUT THEN - My little Sister-In-Law, her hubby & our beautiful new nephew drove up from AZ. They spent almost 2 weeks with us! Our Thanksgiving dinner was fabulous. Everything was delicious. We had my husbands best friend (from childhood) & his girlfriend as well as Rebecca and Kiel, our friends from the Wynn join us. We had cocktails, then a fabulous dinner. After dinner we actually went swimming and ended up in the jacuzzi. Then it was video games and Christmas movies. It honestly was a day that I felt incredibly grateful. That's all I could think of all day! I had my brand new nephew and my baby sister-in-law with me as well as everyone else important that joined us. I was able to provide a wonderful dinner and cocktails & I had a beautiful home to host it in. 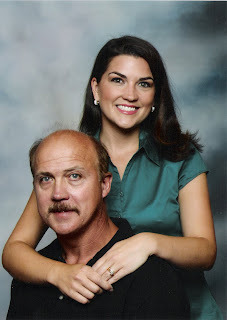 In 2005, my father and I survived a near-fatal car crash. He pulled my lifeless body from the car - he sat in shock on the side of the road as I laid there not responding to him. That moment has forever changed who we are and what we want out of life. A bond of father & daughter was created like no other. In a split second, we both thought it was going to be our last breath, for a moment, my father thought I was dead. That definitely created a bond that I will be forever grateful for. He is a man that I trust and love. A man that had given me my work ethic as well as great morals and values. I am proud to say he is my father. I am proud to say I am just like him. I am so grateful that I can finally call him my friend. Happy 50th Birthday Dad, I am so blessed that you were born! 7 months ago, I was transferred to a job I ended up absolutely despising! For the first time in 7 months, I am back at my old job this evening!!!!!!! I could not be more elated at this time! The girls at my old job were more like family & seeing them this evening is going to be a big boost in the way I feel. I needed this so terribly badly! (don't know if that even makes sense, I am just too excited to care). What have I learned? I have concluded that our careers have a tremendous affect on our emotions and our physical well being. We, as humans, all have to work - therefore - work where you are happy. We only have ONE chance to live. ONE. No second chances, therefore do what makes you happy. If your don't - you'll be extremely unhappy and everyone around you will feel it. It's not worth it.